Der städtische Wärmeinseleffekt (Urban Heat Island Effect, UHI Effect) ist ein anerkanntes Phänomen, wobei sich städtische Gebiete durch ihre umfangreiche Bebauung stärker aufheizen als das ländliche Umland. Vor zwei Jahren hatten wir an dieser Stelle bereits ausführlich über den Effekt berichtet. Im Folgenden werfen wir einen Blick auf neue Forschungsergebnisse aus den Vereinigten Staaten zum Thema. Some parts of the Twin Cities can spike temperatures up to 9°F higher than surrounding communities thanks to the “urban heat island” effect, according to a new study from the University of Minnesota. The study, which was funded by the Institute on the Environment and published in the Journal of Applied Meteorology and Climatology, used a network of 180 sensors deployed throughout the Twin Cities metropolitan area in residential backyards and city parks to paint the most detailed picture anywhere in the world of how temperature varies with time and place across pavement-filled metropolitan areas and surrounding communities. In urban areas during the winter when snow cover is less pervasive, temperatures are higher than rural areas in the daytime by an average of 2 °F. “We’ve long known that heat radiated by buildings, roads, bridges and other structures keeps surface air temperature higher in cities than in surrounding areas. However, temperature is officially measured at just a few locations in most cities, so awareness of the extent and variability of urban heat island effects was limited,” said lead author Brian Smoliak. “Our study highlights the usefulness of dense sensor networks for urban weather and climate research with practical implications for human health, energy consumption, and environmental quality.” Smoliak began the project as a postdoctoral researcher in CFANS and is now an atmospheric scientist at the Climate Corporation in Seattle, Washington. The more detailed understanding of urban heat islands provided by the study can help health professionals and others target efforts to protect people and infrastructure from heat-related problems, according to project co-leads Tracy Twine and Peter Snyder, associate professors in the College of Food, Agricultural and Natural Resource Sciences. Eine Meldung aus Arizona auf tucson.com vom 13. Oktober 2016 gibt Gelegenheit zum Schmunzeln. Forscher haben den UHI-Effekt in einer großen Photovoltaik-Test-Anlage in Tucson bestimmt und fanden, dass im Bereich der Solaranlage spürbar höhere Temperaturen herrschten als im Umland. Nicht ganz im Sinne des Erfinders, denn die erneuerbare Energieerzeugung sollte doch eigentlich die Erwärmung bremsen, führt jedoch in Wahrheit zu einer bedeutenden lokalen UHI-Erwärmung. Solar panels, while they mitigate the effects of global warming by replacing fossil fuels, can add heat in the locations where they are installed, reports a team of University of Arizona researchers. At first blush, the experimental results, published Thursday in Nature Science Reports, seem to contradict computer simulations that said solar photovoltaic arrays, by intercepting some of the sun’s warming rays and converting them into electricity, would have a cooling effect.The UA researchers measured the heat-island effect of a solar array at the UA Tech Park at Rita Road and Interstate 10. They found that its overnight temperatures were about five to seven degrees (Fahrenheit) warmer than a nearby plot of undisturbed desert. Auch die Vegetation reagiert auf die städtischen Wärmeinseln, wie eine Meldung der University of Wisconsin-Madison vom 25. Mai 2016 zeigt. In den Städten brechen die Knospen im Frühling früher auf als im Umland, fanden jetzt Forscher der Universität. The spring green-up underpins many important natural processes, like the budding of flowers and release of pollen. Throwing off the timing of this cycle can have cascading effects on urban ecosystems that may be harmful to birds, butterflies and other wildlife in search of food and habitat. The study shows that urban parks can provide them “cool island” refuges, with natural conditions to which they are better accustomed. The study is the first of its kind to examine how variations in urban development impact the length of plant growing seasons at fine scales within a city. The research team relied on a uniquely dense network of temperature sensors scattered in and around Madison to get such a detailed look. The sensors measured on-the-ground temperatures, which indicated when the potential growing season started and ended, and the team compared these measurements with satellite imagery that showed when vegetation actually turned green and brown. The sensor data revealed that unless researchers are accounting for the types of plants they are observing, satellite data may not be the best way to tease out the temperature-based effects of urbanization on plants. The satellite-based method is commonly used to assess the start and end of growing seasons, but it may be sensing changes unrelated to the urban heat island, the team’s methods suggest. Die systematische Klassifizierung von Wetterstationen hinsichtlicher ihrer UHI-Beinflussung und -Entwicklung sollte schleunigst in Angriff genommen werden, auch in Deutschland. Entsprechende Parameter wie Flächenversiegelung, Zentrumsnähe etc. lassen sich mit Google Maps und anderen Satellitenbild-Katalogen gut dokumentieren. Die Kalte-Sonne-Redaktion fragte diesbezüglich Anfang des Jahres (2017) beim Deutschen Wetterdienst (DWD) an: Liegen diese UHI-Kennwerte für das WD-Wetterstationsnetz vor? Eine Antwort gab es leider nicht. Aus dem beredten Schweigen muss geschlossen werden, dass diese Informationen nicht vorliegen. Warum hier geschlampt wird und die systematische flächendeckende UHI-Betrachtung ausleibt, kann man nur raten. Wurde ein Teil der dem Klimawandel zugerechneten Erwärmung vielleicht vielmehr durch UHI verursacht? Hier herrscht reichlich Forschungsbedarf, an den sich aber aus Angst vor politisch “falschen” Ergebnissen vermutlich niemand heranwagt. Inner cities as well as suburbs show distinctly warmer temperatures—known as the urban heat island effect—than rural areas as a result of land use and human activities, which can affect rainfall, air quality and public health. A University of Georgia study using a new method for calculating urban heat island intensities clarifies the conflict on whether urban density or sprawl amplify these effects more. It also provides a ranking of the top urban heat island cities among the 50 largest metropolitan statistical areas. The urban heat island effect describes how the spatial configuration of cities, the materials in them (such as asphalt), lack of vegetation and waste heat can modify temperature. The study, published in the journal Computers, Environment and Urban Systems, identifies Salt Lake City, Miami and Louisville as the top three urban heat island cities in the U.S.
Urban morphology—the patterns of a city’s physical configuration and the process of its development—has long been associated with the formation of urban heat islands. By examining the UHI intensities of 50 cities with various urban morphologies, the researchers evaluated the degree to which city configuration influences the UHI effect. “The overall goal of our study was to clarify which urban form—sprawl or more-dense development—is most appropriate for UHI mitigation,” said the study’s lead author Neil Debbage, doctoral student in the Franklin College of Arts and Sciences’ department of geography. The study establishes a method for estimating UHI intensities using PRISM—Parameter-elevation Relationships on Independent Slopes Model—climate data, an analytical model that creates gridded estimates by incorporating climatic variables (temperature and precipitation), expert knowledge of climatic events (rain shadows, temperature inversions and coastal regimes) and digital elevation. The use of spatially gridded temperature data, rather than urban versus rural point comparisons, represents a new method for calculating a city’s canopy heat island intensity. The results identify the spatial contiguity of developed areas as a significant factor influencing the magnitude of the heat island effect. “Not just whether cities have high-density development, but how the built infrastructure is connected—and disconnected by green spaces—has a great impact on heat island intensity,” said study co-author Marshall Shepherd, the UGA Athletic Association Distinguished Professor of Geography and Atmospheric Sciences. “We found that more contiguous sprawling and dense urban development both enhanced UHI intensities. In other words, it does not appear to be a simplistic either-or situation regarding sprawl or density,” Debbage said. 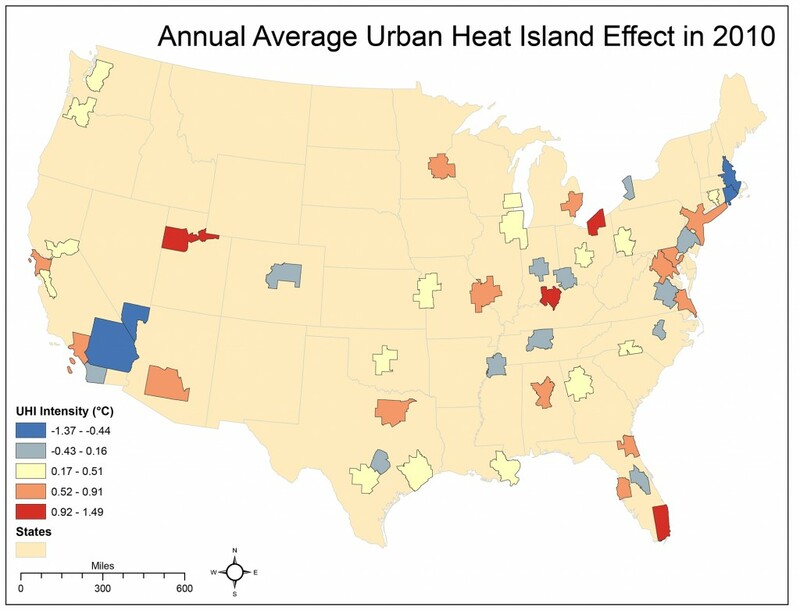 The researchers hope the results can help influence local governments and city planners in the formulation of effective codes and policies to mitigate the urban heat island effect. “It’s crucial to work toward a better understanding of the complex processes at the intersection of urbanization, climate and human health,” Shepherd said. “Current and future cities will be modified or designed with weather and climate in mind, and research at UGA will play a key role. The study on “The Urban Heat Island Effect and City Contiguity” is available at www.sciencedirect.com/science/article/pii/S0198971515300089. A new study about the surface temperature record presented at the 2015 Fall Meeting of the American Geophysical Union suggests that the 30-year trend of temperatures for the Continental United States (CONUS) since 1979 are about two thirds as strong as officially NOAA temperature trends. In der Abbildung von Watts und Kollegen zeigt die blaue Kurve die Erwärmung für UHI-arme Stationen, wähend die rote Kurve für stark UHI-belastete Stationen steht. Siehe auch Diskussion der Resultate auf Judith Currys Website. Figure: Comparisons of 30 year trend for compliant Class 1,2 USHCN stations to non-compliant, Class 3,4,5 USHCN stations to NOAA final adjusted V2.5 USHCN data in the Continental United States. Quelle: AGU. Weiterer Lesetipp: Rud Istvan brachte auf WUWT weitere vergleichende Beispiele aus den USA von UHI-reichen und UHI-armen Stationen. Fazit: Der städtische Wärmeinseleffekt führt zu großen Temperaturkontrasten in den USA und anderswo. Da die Verstädterung weiter voranschreitet, verändert sich auch die UHI-Beeinflussung. Stationen müssen detailliert auf ihren UHI-Grad untersucht und klassifiziert werden, um mögliche UHI-Effekte in lokalen Temperaturkurven sauber zu identifizieren und von der landesweiten und globalen Temperaturentwicklung abzuziehen.